OnOne Perfect Effects 9 FREE! February 20, 2015 Geren W. Mortensen, Jr. Perfect Effects 9 can work as a stand-alone application, or as a plug-in to Lightroom, Aperture or Photoshop (CC or Elements). For a lot of folks, the combination of Lightroom and Perfect Effects could be all you ever need. Depending on how you want to work, Perfect Effects could be all you need. Again, this is a fully licensed version of Perfect Effects 9 - no trial or limitations. You can read about what Perfect Effects 9 can do for you here. Better yet, just go to the offer link and download the software and play. Note: I have no affiliation with OnOne Software. As you may remember, I built a pedal board for my keyboard rig last year (see related posts at right for the full story). Well, after playing with it for almost a year now, I've pretty much settled in to the way I actually use it, so for parts of yesterday and today, I slaved away in my hot and humid garage to make some revisions. I like my volume pedal under my right foot, and don't like to have to cross my foot over to get to it. Obviously, it was time for some rearrangement. Here's the new arrangement, as it appears today. You'll notice that I'm down to the big master volume pedal (far right), the expression pedal for the G3 (second from right), the dual sustain pedal (center), a new silver gizmo with a blue wire and two switches(second from left, more on that later), the TC Helicon Mic Mechanic (bottom left), and of course, the Zoom G3. The big empty space in the upper right is plenty big for the Blueboard. I'm only hoping it's convenient enough to reach when scrolling through a song or set list live. By this point, you may (or may not) have guessed that the silver gizmo with the blue wire and two switches is there to make moving around the G3 easier. Stomping on the left switch of the silver gizmo is like dancing on the "1" and "2" switches on the G3 at the same time, and the right one is like getting G3 switches "2" and "3" together. Pretty cool, and it works exactly as expected. The wiring for the G3 mod was found on the Ashbass site. I couldn't mount the Blueboard yet, as it's over at the practice space. I'll play with that tomorrow night when we get the band together to rehearse and work with a new guitar player (who will, hopefully, decide to stick with us for a while -- it'll be his first night). I've also finally got another Ernie Ball VP Jr on the way, which will probably not be here in time for practice tomorrow. It will replace the M-Audio plastic-fantastic piece as the expression pedal once it does arrive, which should be late this week. 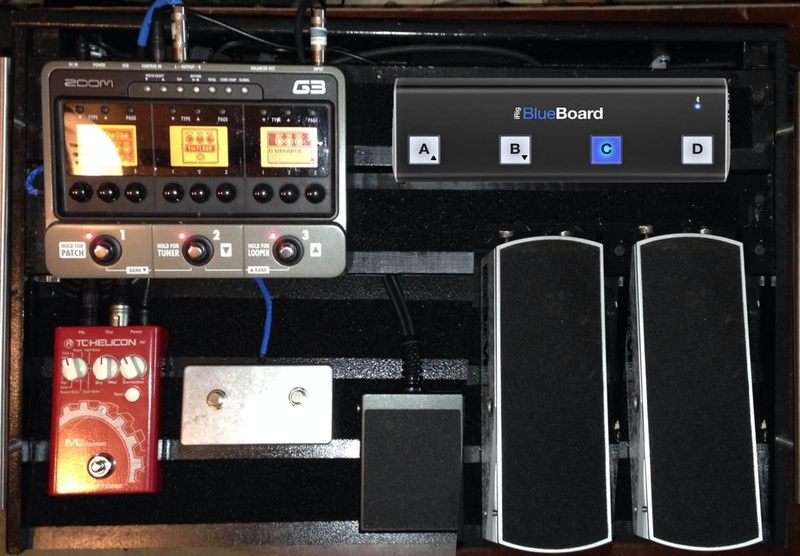 Once everything is in place, the new iteration of the pedal board should look something like this. July 20, 2013 Geren W. Mortensen, Jr. Some time back, I purchased a couple of effects as "place holders" to use temporarily until I could afford something more suitable. I've also been rather unhappy with the Tech 21 "Blonde" overdrive pedal. While it's great for guitar, it's a bit too sensitive for use in an effects loop or with keyboards. If you look back at the previous entries in this series (links are at the top of this post), you'll see that I was intent on buying some "boutique" pedals to replace them. However, after some research, and at the urging of our bass player, I decided to pick up a Zoom G3 guitar multi-effect and amp simulator. Our great little local music store, Coffey Music, happened to have a used one at a very attractive price (better even than used prices on eBay!). The G3 is a programmable replacement for several stomp boxes. At any one time, three are displayed on the panel and work just like a "real" effect. With the recently released version 2.1 firmware loaded, the G3 can actually have up to six effects running at a time. While it's really easy to program from the front panel, it's even easier to use the free editor software to lay out a complete effects pedal on screen. In addition to saving to the G3, effects setups can be saved to disk or shared with other users through Zoom's user community. I'm not going to put it into the pedal board just yet. We have a private party gig in a week, and I don't want to disrupt the setup so close to a gig. In the mean time, I'll start setting up at least the basics. Then, I can fine tune it for each song. September 7, 2012 Geren W. Mortensen, Jr. Earlier in this series, I mentioned that I'd post my thoughts on the Behringer el-cheapo effects pedals that I purchased to use as temporary effects until I can find and afford my "holy grail" pedals. Last night, I had the opportunity to try the "complete" pedal board at practice. The overall results were almost exactly what I had hoped for, especially on electric piano and organ sounds. Summing the project up in one word: success! So, let's talk a little bit about what $25 will buy you in an effects pedal. I purchased the UT300 Ultra Tremolo and the VD400 Vintage Delay. I've already mentioned that the construction is, well, cheap. The box is made of some sort of high-impact plastic, and that seems to include the hinge-point where the foot pedal switch connects to the chassis. I also already mentioned that the big, rubber pad on the base pretty much fell off in my hands when I was velcroing one of the pedals to the board. If you're a heavy-duty stomper, I really don't know how long this construction would hold up. I'd be especially concerned if you're not using some sort of pedal board. Moving on to the controls, each pedal has three controls that operate smoothly, but they are, again plastic. They're also not attached to the chassis, but only held in place by the solder joints on the circuit board. The same is true of all of the input and output jacks. The foot switches are not true-bypass, for those who are super-concerned about such things. I know that I eventually want all of my pedals to be true-bypass, even though this is not as much of a consideration for a keyboardist as it is for a guitar player. Both pedals have a "standard" 2.1mm, negative-tip 9V coaxial power jack located on the right side of the chassis, next to the input jack. There are three controls on the tremolo: Rate, Depth and Wave. The Rate and Depth controls are pretty self explanatory -- they control the rate and amount of the effect. The Wave control is pretty cool. It allows you to select between a sine wave for a nice, smooth pulsation or a square wave for severe chop effects. But, it's not a switch, and that allows a choice of wave shape anywhere between sine and square waves for a wide range of effects. In use, the UT300 is very transparent, in that there's no apparent coloration of the sound. Just a nice tremolo effect. I also noticed that there's no pop or volume jump when you turn the effect on -- gain is effectively at unity and the electronic switching is dead silent. In all, the UT300 is a good sounding, predictable analog effect at a bargain price. The VD400 Vintage Delay is a basic, analog delay that offers up to 300ms of vintage, bucket-brigade echo. Again, there are three controls involved: Repeat Rate, Intensity and Echo. In this case, the Repeat Rate is the delay time. Turning the control to the left makes for shorter delays and turning the control to the right lengthens the delay time, from slap-back timings to the spacier 300ms setting. Intensity controls the number of repeats, and Echo is the mix between dry and wet signal. Again, the sound quality is very impressive. Short delays and lower repeat rates are clean and warm. Cranking the Intensity control results in a delay that "gets dirty" as the repeats build, very much like vintage tape echo. As with the UT300, switching is silent, and gain is nicely balanced -- no pops or jumps. Just nice delays. Based on my experience so far, if someone told me that they were on a tight budget and needed some inexpensive pedals, I'd very likely tell them to consider the Behringer effects. While there are certainly caveats to the build quality, I think that as long as they're treated decently, they'll perform quite nicely -- especially if they're on a pedal board and powered using a 9V adapter. Obviously, you can't be jumping on these and simply throwing them into the back of your amp. But, for someone who needs something now while they're putting a better rig together, or for someone just starting to use effects, they're a bargain. Behringer list American Musical Supply as the only on-line dealer for these, and that's where I ordered mine. Some local music stores carry the Behringer pedals as well, and if you can, I always suggest supporting your local music store. In my case, I would have bought at Coffey Music in Westminster, MD, if they had been in stock. September 2, 2012 Geren W. Mortensen, Jr.
And here it is. There are still a couple of details to fill in. I'm short one jumper cable, and a couple of the pedals are inexpensive "place holders" until I can find/acquire better ones. In the top row, right to left, we have the Lovepedal Rubber Chicken (a dynamic filter/auto wah); a Behringer tremolo and analog delay (these are the cheap-o place holders); the Tech 21 NYC Blonde amp simulator/overdrive; and the Line 6 Roto Machine rotary speaker emulator/over drive). On the bottom, from right to left, is the volume/expression pedal for the PS-60; the DSSP dual sustain pedal; volume/expression pedal for the X-50; and a master volume pedal for the effects loop. The open space on the lower left is reserved for a TC Helicon Mic Mechanic vocal effects pedal. A Gator soft case is on order, and should arrive on Tuesday (it was supposed to arrive Friday, but FedEx totally blew it). The big, fat "cable" coming off the top-center is the umbilical to the keyboards, bundle up in a wire loom to keep things looking neat. The big bundle off the top right are the cables to the amp. Overall, I'm really pleased with the result from this project. Long term, I will probably replace the amp simulator/overdrive with a more straight-forward overdrive pedal. While I've got it dialed in a little better, the Blonde is still really, really sensitive, and goes from clean through overdrive and into hard distortion way too easily. When I ordered the two Behringer pedals, I knew that for $25 a piece, they'd only be but so good, and I was right. It's not the design and sound that's disappointing -- they're nice copies of some vintage pedals -- but the build quality is pretty cheesy. On the outside, almost all of the construction is a high-impact plastic. Inside, low-cost made-in-China circuit boards and components are the rule. Mounting the Behringer pedals was somewhat humorous. The bottom of the pedals have thick rubber cephalopod-like feet. I stuck a big hunk of Velcro to the underside, plopped the pedal on the board, and then went to position it. The rubber pad came right off the bottom. Fortunately, the stickum on the Velcro is really good, and I didn't waste a 2"x4" hunk of that! After discarding the rubber piece, the Velcro grabbed to the stamped metal plate on the bottom of the pedal (I think it's the only metal part in the entire thing) and is holding the pedal fast. I knew going in that these were intended to get me an effect I need quickly while I search for the "holy grail" pedals. For instance, Lovepedal is working on an upgrade to the Gen5 Echo, and I can't imagine it being anything but stellar. I love the sound of the Gen5, but I want to hear the new one before I buy. And, Earthquaker Devices have the incredible Dispatch Master. I know, the Dispatch Master has a digital delay, but it sounds really, really nice, and the price is quite tempting. What's more, Earthquaker Devices are made in Akron, OH. That's where I was made! For the trem, I'll be looking for something along the lines of the Suhr Guitars Jack Rabbit. The features that make it the top of the heap, in addition to great sound, are the array of modulation controls -- variable wave shape is a big deal that will allow going from subtle pulsing to radical chop sounds like those heard on The Who's Won't Get Fooled Again. Finally, the replacement for the Blonde will probably be something along the lines of the J. Rockett Audio Designs Blue Note OD. It sounds super-smooth and subtle. The project to build the pedal board ended up costing more than I had hoped, and took longer than I wanted it to. But, in the end, I'm getting exactly the pedal board I need -- there simply isn't a commercial pedal board that's made that's "right" for a keyboardist. I did play with it in an incomplete state at our last practice, and everything fell into perfect place. June 19, 2011 Geren W. Mortensen, Jr.
As many of you know, I'm always interested in ways of obtaining great results, without spending a fortune. It's driven my choice of camera bodies, lenses, computers and software -- on my Macs, the most expensive piece of imaging software I own is Lightroom, which costs $79 from Apple's App Store. So, when I stumbled across Flare, a $19.99 imaging program from The Iconfactory (available for $9.99 for a limited time via the App Store), I was certainly intrigued. Could a $20 piece of software actually be any good? The program is really quite good at quickly applying a variety of effects to images, with a decent level of control. And, it works with pretty much any kind of image you can throw at it. For the images here, I started with JPEG images from our last trip to Maine. For the bicycle image, I wanted to fix the color and exposure a little bit, and apply an interesting boarder. I spent more time looking at the available borders than in applying the actual effects. Total processing time was about 5 minutes. The Flare interface is quite simple, and very easy to learn. Every thing you want to do can be previewed, including blending modes, with simple flyouts. Image editing can be accomplished using presets, which can be modified. You can also create your own presets, which can be saved and shared via the company's web site. Every aspect of a preset is also editable, and the whole thing cab be saved as a snapshot, which includes an image and all the effects used to make it. The final output can be saved as a file to disk, sent to your iPhoto library or shared via Flickr or E-mail. Another interesting feature is that, if you have an image open, and you open a second file, that file will be opened "into" the current working space, so any effects or settings applied to the first image will be immediately applied to the second image. The program remembers up to 24 snapshots for immediate recall, and once applied to an image, they can be saved as a preset. I'm particularly impressed with the single-click black-and-white conversion. It's about the nicest I've seen anywhere.